Silvio Elmano 4 months, 1 week ago. Android Nougat 7.1 ROM for Galaxy NOTE 10.1 N8000/801X CM14.1 (CyanogenMod 14.1) has now arrived through an UNOFFICIAL build. For latest updates, stay tuned to the Lineage OS device list page. This Nougat 7.1 has come for Galaxy NOTE 10.1 N8000/801X via CyanogenMod 14.1 ROM. Since Google released Android Nougat Source code, we have update many Android NOUGAT AOSP ROMs and also many CyanogenMod 14.1 ROMs updated and many are yet to come. This Galaxy NOTE 10.1 N8000/801X for CyanogenMod 14.1 is brought to you by developer lirokoa. Download and Copy the GApps and Galaxy NOTE 10.1 N8000/801X CyanogenMod 14.1 ROM ZIP to your phone. 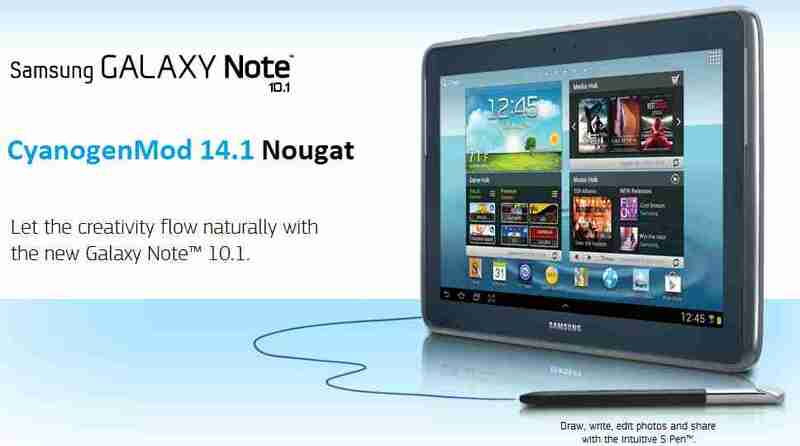 Reboot and Enjoy the CyanogenMod 14.1 Nougat ROM on Galaxy NOTE 10.1 N8000/801X. Copy the latest Galaxy NOTE 10.1 N8000/801X CyanogenMod 14.1 ROM ZIP file to your phone. Stay tuned or Subscribe to the Galaxy NOTE 10.1 N8000/801X forum For other Android Nougat ROMs, CyanogenMod 14 ROMs, other ROMs and all other device specific topics. The development thread is here for this ROM. Today I tried to update, but a message appears informing “signature error” for the compressed file. Unfortunately it does not really work. This file signature error prevents ROM installation. After making all the wipe, the installation begins, but terminates when the signature failure appears, and the N8000 reboots with the current ROM that is already installed on it. I installed CM14 on my Glaxy Note 10.1, N8000. Everything worked perfectly. But the Note stopped. The battery has stopped charging. Has anyone else had this problem? Was it coincidence or some incompatibility between software and hardware?